As we head for the last quarter of the year, “time is on my side” could be an appropriate theme for investors in the US stock market: As we write this, we are still in the midst of record setting sessions for the major stock market indices. Even more surprising is how investors appear to be greeting this perpetual march higher: kind of with a big yawn and seemingly with no concern for whether the gains can be supported economically. Take the performance of the Chicago Board of Exchange (CBOE) Volatility Index: This widely held measure of stock market nervousness, or the so-called “fear gauge” now trades at 10.67, well below its average of 19.04 between 1990 and 2008. Another way to look at it is this: The S&P 500 has gone the longest number of days since 1929: 346 at this writing, without a pullback of 5% or more. (The crash of 1929 was preceded by a 369 day stretch—we are getting close). This is despite the fact that there have been mounting geopolitical risks, namely North Korea, as well as the failure so far this year to accomplish anything pro-economy or pro-growth on the policy front, such as tax reform (which may still happen before year end). The global economy is humming: The US revised its second quarter Gross Domestic Product (GDP) to 3.1%, the highest reading since the first quarter of 2015. Initial third quarter estimates are 2.7% and for the whole year are 2.3% (according to the Wall Street Journal). These are not gangbusters by any means, but respectable enough to generate solid earnings growth through the remainder of this year. The US industrial and manufacturing sectors remain well in expansionary mode, assisted by weakness this year in the US dollar, which helps our exports. Inflation remains fairly subdued: Wages are growing at a stubbornly slow pace despite an economy that is at full employment, largely due to automation and globalization. Stable and low oil and commodity prices are also helping. The Eurozone and Japan are finally pulling their weight: Second quarter GDP growth came in at 2.3% and 2.5% respectively, and expectations are that both regions could accelerate to 2.5% by the fourth quarter, according to TradingEconomics. China’s growth rate remains stable at around 7%, as does India’s. It’s just as important to be mindful of potential risks, however, whether they arrive in the form of natural disasters or geopolitical conflicts, or a surprise piece of negative economic data, such as a spike in inflation. As a result, we make sure that we are maintaining diversified exposures that help manage risk and smooth out returns in our clients’ portfolios. And while there has been a broad-based rebound in stocks since the end of the financial crisis in 2009, not all sectors of the market have participated equally. If you had just owned the technology and biotech heavy NASDAQ stock market index, you would have done twice as well as if you had just owned the S&P 500. 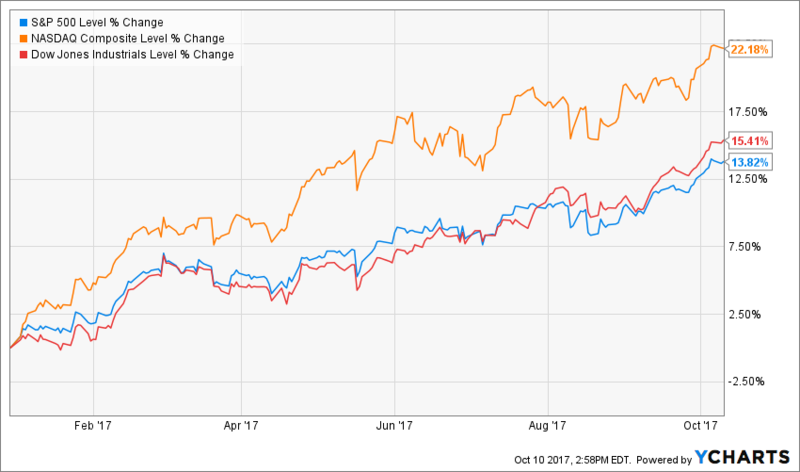 That advantage of owning growth – even emerging growth – instead of more value-oriented investment styles (or just good old blue chips) continued through this year yet again with the NASDAQ up more than 22% year to date, nearly 10 percentage points better than the performance of the S&P 500. As a result, the valuation-or price we are willing to pay–for the market overall, and particularly for the higher growth segments of the market, has gotten even more expensive. That’s not to say it can’t keep rising, particularly if earnings come through as expected (or better than expected) the remainder of this year. But it leaves little room for error. We also need to consider whether time will stay on our side as far as volatility goes. All eyes will be on the Federal Reserve at its next meeting in December. At its last meeting in September, the Fed’s tone was much more hawkish (i.e. leaning toward increasing interest rates) than many had expected. Most market observers are now anticipating another rate increase in December. At the same time, the Fed announced its long-awaited plan to begin shrinking its balance sheet starting this month. So instead of purchasing bonds and injecting more money into the system as they had been doing, the Fed is going to just let its portfolio run off (i.e. let the bonds mature). This could cause upward pressure on interest rates, and give the markets a jolt – even if it’s a temporary one. As far as our fixed income approach goes, the risk vs. reward tradeoff for extending duration given the current level of interest rates may not be prudent given the role (stability) we expect the fixed income allocation to serve in a diversified portfolio. On a more entertaining note: As long term sponsors of Maine Maritime Museum, we have been given 25 complimentary admission passes. So if any of you would like to go to the museum on us, please give us a call as soon as possible as we will be handing them out on a first come, first serve basis. Turning to year-end housekeeping items: We always aim to minimize capital gains taxes for you as best we can, and it’s important to understand if there are any specific considerations we should be mindful of. We still have plenty of time to prepare for year ending tax planning issues, so if something is on your mind, please give us a call or come on in. Additionally, thanks to rising prices, many of us own stocks with even more significant unrealized gains this year than ever before. If you are planning on making any charitable contributions this year, using appreciated stock as well as required minimum distributions from your retirement accounts (assuming you are over the age of 70½) may be the most tax efficient strategies to consider. As always, we are happy to assist you with these as well as any other questions you may have about your portfolio or planning. Cribstone Capital Management. (“CCM”) is an SEC registered investment adviser located in the State of Maine. The firm and its representatives are in compliance with the current registration and notice filing requirements imposed upon SEC registered investment advisers. CCM may only transact business in those states in which it is notice filed, or qualifies for an exemption or exclusion from notice filing requirements. For information pertaining to the registration status of the firm, please contact the SEC on its website at www.adviserinfo.sec.gov. A copy of the firm’s current written disclosure brochure discussing the firm’s business operations, services and fees is available from CCM upon request.